Founded on the principle of People Helping People, credit unions live that mission every day. Lost or stolen Visa Debit Card or ATM Card? If your card is lost or stolen, you must notify us immediately. During business hours, call the credit union Main Office at 216-587-0631 or St. Francis de Sales Office 440-888-3663. If you realize that your card has been lost or has been stolen and the credit union is not open, please call Cardholder Services directly at 1-866-820-8807 then notify the credit union. If your VISA credit card is lost or stolen call Visa Customer Service 727-570-4881 and report the card lost or stolen then notify the credit union. If you plan to use your All Saints FCU Credit Card or Debit Card while traveling, we request you to notify us in advance of your departure date. Credit Unions are mission-driven financial cooperatives. Groups of average Americans pooling their money and resources to help one another. Founded on the principle of People Helping People, credit unions live that mission every day. They enrich the lives of their members and communities. Each member of a credit union is a full owner and has an equal voice. Credit union earnings are returned to members in the form of better rates. 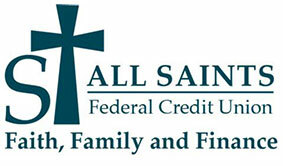 If you are looking for something different, a place where you are an equal owner, to offer you affordable credit, to build your wealth and where every decision is made with your best interest in mind, explore All Saints Federal Credit Union.